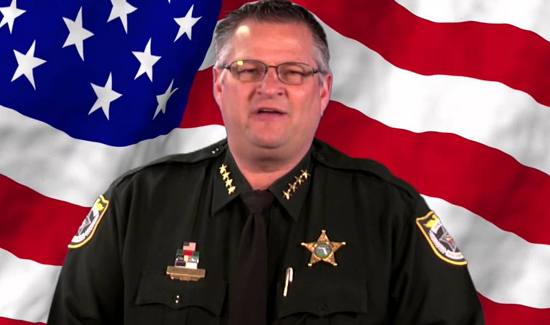 Brevard County Sheriff Wayne Ivey—above, in his signature green uniform—fired up the crowd at a Melbourne rally with a speech that endorsed Republican presidential candidate Donald Trump. The popular sheriff seems to be everywhere in politics these days, always wearing his uniform with badge, utility belt and four gold stars pinned to each side of his collar. Voters saw Ivey in local TV ads that endorsed Republican Thad Altman for state House. He appeared on countless direct-mail postcards endorsing more than a dozen candidates for judge, school board, county commission and state Senate. Which has caused some, including me, to ask: Can he do that while in uniform? Other public servants including firefighters, wildlife officers and Air Force service members would get into trouble if they campaigned for someone while in uniform, even if they did so while off duty. But sheriffs, I learned, fall under a little-known exception to the law and are free to lend their prestige and the symbolism of the uniform to political candidates and issue-related campaigns.